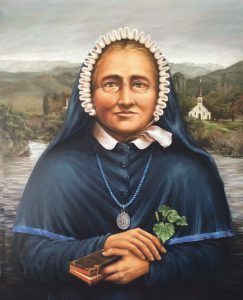 Sunday 7 October 2018 marks the third annual Celebration Day for Venerable Suzanne Aubert in all Catholic churches throughout New Zealand. On that day parishioners will be asked to participate in celebrating the ‘spirituality and good works’ of Suzanne Aubert and to pray a special Prayer of the Faithful at Sunday Mass. Parishes have also been asked to play a specially prepared five-minute video that introduces the idea of making a personal pilgrimage in New Zealand by retracing Suzanne’s own footsteps throughout Aotearoa New Zealand during the 66 years she lived in this country. As a migrant from her native country of France, at 25 years of age, Suzanne spent three months travelling to New Zealand on a small whaling boat, the Général Teste, in 1860 so she could answer the call of Christ: the call to serve the Māori, the sick, the orphaned, the elderly and those whom society rejected. She travelled extensively throughout the country, becoming fluent in Māori and establishing a rapport with the tangata whenua. Her charism was care of the vulnerable wherever she encountered them and led her to establish New Zealand’s first soup kitchen and other core services at the turn of the century including orphanages for abandoned children, social care of single mothers and the disabled, a hospital for the sick and hospices for the dying. 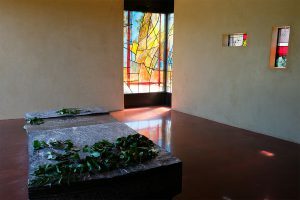 Crypt and final resting place of Suzanne Aubert, at Home of Compassion, Island Bay. 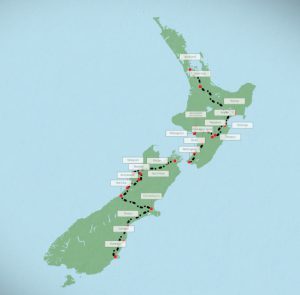 To help people plan a pilgrimage and learn more about the 24 places around New Zealand where Suzanne lived and worked, a special digital pilgrimage map has been created on the website (suzanneaubert.co.nz) and there is also a downloadable map guide. It is hoped that many more New Zealanders will learn of the spirituality and good works of Venerable Suzanne Aubert and in doing so, see her as a leading light in the establishment of social welfare in New Zealand and a wonderful example to follow. For more information on the Footsteps through Aotearoa New Zealand campaign, contact the National Convenor John Bergin (john@suzanneaubert.co.nz) or Sr Josephine Gorman, the archivist for the Sisters of Compassion (sr.josephine.gorman@compassion.org.nz). 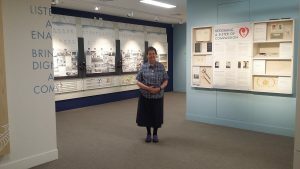 Sr Josephine Gorman, archivist for the Sisters of Compassion was instrumental in selecting content for the new exhibition. A new exhibition that tells the rich story of the Sisters of Compassion opened on 18 September 2018 in the Suzanne Aubert Heritage Centre at the Home of Compassion in Island Bay. Suzanne Aubert founded this congregation of religious women in Hiruhārama-Jerusalem on the Whanganui River in 1892. The Sisters have touched the lives of people across cultures, generations, and social positions. Their mahi has taken them throughout New Zealand, Australia, and the Pacific. They have been held in high and affectionate regard by Wellingtonians since their arrival in Buckle Street in 1899. Designed by Craig Turvey of 3D creative, visitors to the exhibition sense the contribution of the Sisters to New Zealand’s history and society and can delve deeper into the story through a range of interactive features. The Home, well known for its time as a hospital, is now a spirituality centre, an urban oasis, just minutes from central Wellington. Visitors and pilgrims are invited to discover the Suzanne Aubert Heritage Centre and exhibition rooms, Chapel and the Resting Place of Suzanne Aubert. Opening Hours: 10am–3pm, Tuesday–Saturday; and 12noon–3pm, Sunday. Home of Compassion, 2 Rhine Street (off Murray St), Island Bay. For more information, phone Deirdre Hanlon, Visitor Experience Manager (04) 282 1953.